Built in 1980, by the Orange Shipbuilding Company Incorporated of Orange Shipbuilding Orange, Texas (hull #220) as the Maoi for Matson Services Incorporated of Honolulu, Hawaii. In 2005, the tug was acquired by the Hawaiian Tug and Barge Company of Honolulu, Hawaii. A division of the Young Brothers Company of Honolulu, Hawaii. Where she was renamed as the Mahi. In 2013, the Hawaiian Tug and Barge Company was acquired by Foss Marine Holdings of Seattle, Washington. Where the tug retained her name. The tug operates under the company's subsidy, the Young Brothers Company of Honolulu, Hawaii. 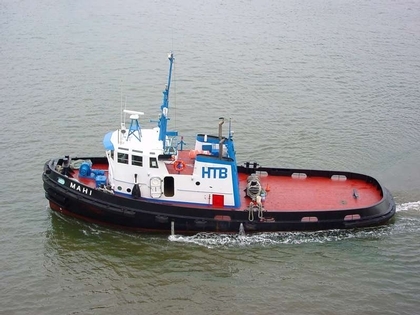 In 2018, the tug was acquired by the Stabbert Maritime Company of Seattle, Washington. Where she retained her name. Powered by two, Caterpiller 398 diesel engines. She is a twin screw tug, rated at 1,800 horsepower.